By Urbannizer, November 2, 2018 in Going Up! 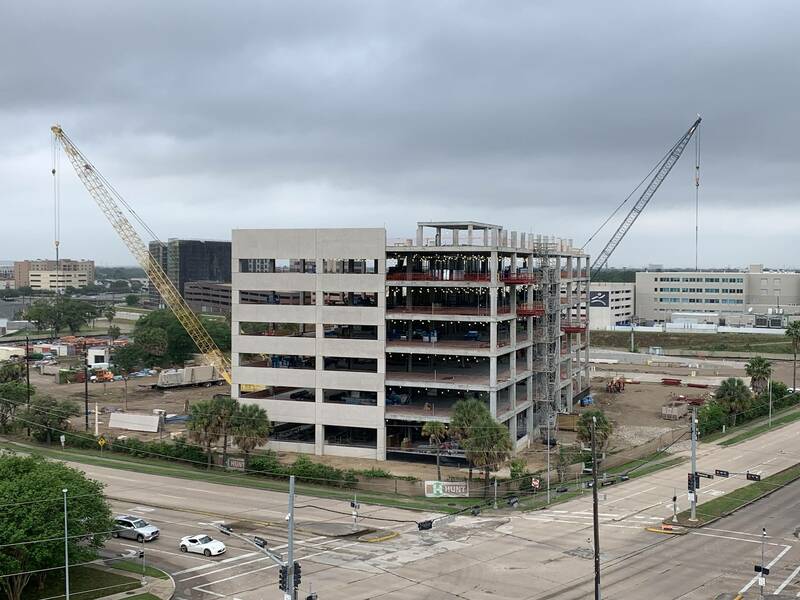 A TOWER crane and accompanying high-altitude construction equipment are now hovering over the northwest corner of S. Braeswood and Greenbriarwhere work on a new 14-story Houston Methodist office midrise is underway. Eight of those levels will be devoted to parking, the project manager over at Hunt Construction tells Swamplot. It’s all taking off on what used to be the Astrodome Marriott hotel, torn down after the Methodist system bought the land in 2000. For more than a decade the 10-acre parcelremained unbuilt until a new single-story daycarefor Houston Methodist employees’ kids (ages 0 through 5) sprung up on its western portion last year. The center — a brightly-painted and multi-gabled structure to the left of what’s shown in the photos above — enrolled 130 kids when it opened. Once some of them age out, it’ll consider taking on children of Methodist’s business partners, too, as well as those without any parental ties to the hospital system. Are there any renderings of this? It's amazing how many 15 + storied buildings are going up in the areas outside of the three major building centers (Downtown, Uptown/Galleria, and TMC), right now. I'm speaking to the plethora of mid-rises and high-rises sprouting, like Johnnies Appleseeds all across this fertile plain. It's really remarkable when you take in the big picture. I don't even have a clue to how many building's over 15 stories or more that there are, going up right now, but it has to be some kind of record. SWTSIG? I'm talking about Montrose, the Museum district, Midtown, Kirby District, Rice Village, River Oaks and southern med center NRG astrodome main street area. My point being, that our infill and density levels are going up so fast. Its really remarkable especially considering the sq. miles were talking about. We used to wonder if perhaps the med center and downton would connect. I suggest that Houston will eventually be a minimum 5 to 10 storied area from 59 east to 610 south and on around to Galleria Uptown. and back up I-10 to downtown. There will be small pockets of residential neighborhoods like R.Oaks, West U and parts of Montrose, and Southampton, but the rest will be high-rise and midrise structures. I'm not talking tomorrow. Maybe 50 years, who knows. I just have the last 60 years to compare. We're living in a special time in Houston's history, and it's growth, understanding, and appreciation for the importance of the quality of life, are coming together and we are the beneficiaries and the younger ones will be the stewards of this legacy to grow on. I always love your unbridled enthusiasm and positive out look bobruss, never change my friend. Bobruss makes many excellent points. The construction of apartments and condos within the Loop has been breathtaking. Midtown used to be a wasteland and look at it now. Downtown was impressive, but isolated skyscrapers with almost no night life except the theater district .I believe the construction rate surpasses that of the 1970's to early 1980's. It's going to be interesting to see what the inner loop population is in the next census. I don't believe ( or wish ) to attain the population densities of Hong Kong, Sao Paulo, or Tokyo, Nevertheless the urbannization taking place is splendid. All this even after H. Harvey. What a great city this is. My guess is the population jump will only be striking in Downtown and Midtown plus maybe Museum Park/Med Center in 2020; new developments replaced older, smaller properties particularly in Uptown, Heights, River Oaks/Greenway, and Washington. Also, gentrification and changing demographics skew numbers slightly. With that said, going forward, population should rise quite quickly with any new dense development in these areas--most older housing properties have already been replaced. Also, the rapid de-industrialization of the Inner Loop and industrial boom in the suburban fringe in recent years will add to the population increase over the next ten years. Looks topped out except for the utilities on the roof. From today. This time across the bayou! Don't usually see a lattice boom crane dismantling a tower crane but they might use it later to build the prefab concrete parking garage. They were working on the garage when I showed up. Anyone know if this is actually going to be 14-stories, or has it topped out? I thought the parking levels were being built below the office building. Worker I talked with yesterday said the parking garage would be 7 stories but it seems like a lot for such a short building unless it's to provide parking offsite for other buildings. So is the building under construction 7 or 14 floors? Pre Fab facade, don't see that often.